The playful spirit of Colorado's 28 ski resorts doesn’t fade with the sun during winter vacations — in fact, that’s exactly when ski towns come alive all across the state indoors and out. It can be hard to resist the allure of a well-lighted restaurant or local watering hole, but some truly primo fun for all ages awaits at these awesome night-time activity centers. Keystone Resort made a bold move when it introduced night skiing in 1985, but it was one of the reasons Keystone quickly became one of the country’s leading resort destinations. Keystone rocks and rolls with as much as 15 trails and 243 acres lit beneath the starry sky, including the A51 terrain park, which is the largest in Colorado to be lighted at night. All this acreage means the slopes are typically wide-open, allowing for a relaxing, free-wheeling atmosphere to the experience. Ski Granby Ranch, a long-time family favorite, keeps a handful of runs and three terrain parks fully lit for night skiing and snowboarding on select Fridays and Saturdays during the ski season. The resort’s lift-served tubing hill is also open for under-the-lights merriment. Steamboat also offers night skiing on select runs, and Powderhorn has two special nights of night skiing each February. Vail Mountain co-founder Earl Eaton was well-known for cruising the mountains on his ski bike (a bike with skis for wheels), so it’s no surprise that Vail offers a ski-biking experience as one of the activities available at its popular Adventure Ridge. Offered to intermediate and advanced skiers and snowboarders, the tours run from 4:45–7pm (reservations recommended). 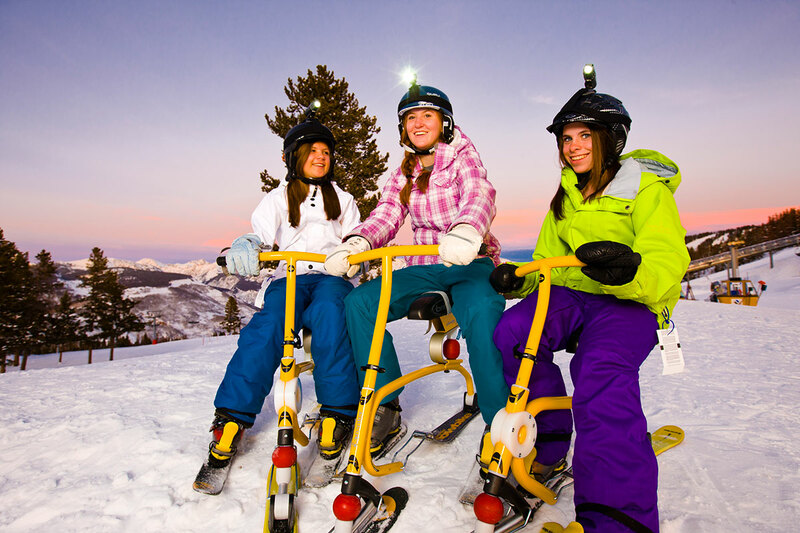 Winter Park Resort also has a ski-biking night adventure from late Dec.–late March. Riders throw on headlamps, get all-important instruction and safety tips and head out for three hours of guided slip sliding down the slopes. That famous pink winter-sky, dubbed “alpenglow,” is one of Colorado’s most spectacular phenomena, and there’s perhaps no better way to enjoy it than from atop Purgatory (formerly Durango Mountain Resort) on a guided Alpenglow Snowshoe Tour (reservations required). The journey starts by riding the last lift up for the day, then hiking through pristine backcountry terrain, with views of the sun setting on Colorado’s snowy peaks, before taking a break at the Powderhouse restaurant for cocktails, hot chocolate and hors d’oeuvres. Visitors can also snowshoe in the moonlight atop 9,100-foot Mt. Werner on Steamboat Resort’s moonlit snowshoe tour and dinner, which includes a post-trek supper at Hazie’s Restaurant. And during every full moon in January, February and March, Copper Mountain hosts free snowshoe excursions through the area’s forest to see the earth’s natural satellite rise above the valley (reservations required). Almost everyone’s seen Aspen/Snowmass’ Buttermilk Mountain alighted by the Winter X Games in January, there's a new event under the lights every Friday night from late Dec.–late March. In honor of the Norse God of Snow, Ullr, Elk Camp at Snowmass is transformed into a cozily lit, winter wonderland. Visitors can tour Ullr's snow castle, slide down the Viking sledding hill or indulge in s'mores and hot chocolate by the bonfire. And Breckenridge hosts its very on Ullr Festival each January, where folks dressed as vikings compete in Ullympic events, watch a parade, celebrate around a bonfire, ice-skate and snowshoe under the stars and much more. For six Wednesday nights, Eldora Mountain Resort keeps the lights on late to welcome Nighthawks — pros and never-evers who come to its slopes for lighthearted races in several events, including downhill skiing, telemark skiing, snowboarding, cross-country skiing, cross-county skating and snowshoeing. Anyone is welcome to sign up — but those in the know show up with headlamps to help light their way. Feel like a star as you swirl around Beaver Creek Village’s ice-skating rink under the lights until 9pm. The fire pits that surround the rink are a cozy place for hot cocoa, and on Monday and Friday nights, disco skate night fills the village with festive music and a light show. Many Colorado ski resorts, including Steamboat, Telluride, Powderhorn, Monarch Mountain, Crested Butte Mountain Resort, Winter Park Resort, Puratory, Breckenridge Resort and Vail, have torchlight parades (where skiers or snow vehicles bedecked with lights stream down the mountain in creative formations) and fireworks on Christmas Eve or New Year’s Eve. Check out the event calendars for all 28 Colorado ski resorts, where holiday fests, themed ski days, concerts and other special events help complete winter vacations year after year, and see our list of fun Colorado apres ski bars and family-friendly ski resorts. Colorado's ski resorts offer summer activities and attractions — consider visiting them during the summer season!